Sorry last week was light on cute posts and videos. We had a nasty stomach bug making the rounds in our house! So about all I got done was hand washing, laundry, more hand washing, cleaning, oh, and did I mention hand washing. Seriously- at 35 weeks prego I really don't need to get this bug :) So far my prayers have been answered and I've avoided getting sick. Now onto some fun eye candy. At my last upline meeting Patsy Waggoner (the head of our group) held a drawing for some free products. Who can resist free stuff! But to make it even sweeter, the envelopes holding the gift certificates were adorable :) Want to see? Isn't it just yummy! I love that she used DSP to make the envelope- it just makes the whole thing that much cuter. With our Simply Scored tool and diagonal plate making custom envelopes is easy- if you haven't checked it out yet you have to try it! Stampin' Up! has even made a video to show you the product HERE. 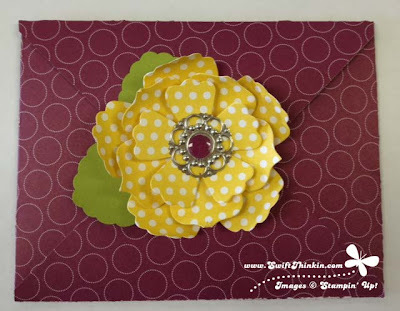 And of course one of my favorite color combos right now is Rich Razzleberry and Daffodil Delight- sweet! Then, don't forget the fun little bling in the middle- these Designer Builder Brads are part of the Spring Mini catalog and will be going away soon, so you had better stock up!